Old Timer Knives are genuine classics made today by Taylor LLC. Featuring saw-cut Delrin handles, brass liners, nickel silver bolsters, and stainless steel blades these are the knives that you remember from bygone times. 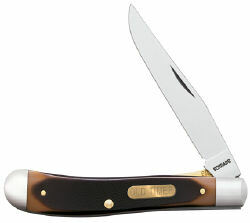 The Old Timer 194OT Gunstock Trapper Pocketknife features a single blade. These knives are imported by Taylor but retain the original patterns that made them famous. This knife is great for an every day pocketknife. It's built well and is a cheap enough price to not worry about using it.